Orchids! Why Don’t They Grow in Dirt Like the Rest of the Plants in the Schoolyard? The orchid family is one of (if not the) largest families of flowering plants in the world. It consists of thousands of varieties and species ranging from the tropics all the way up to Alaska. 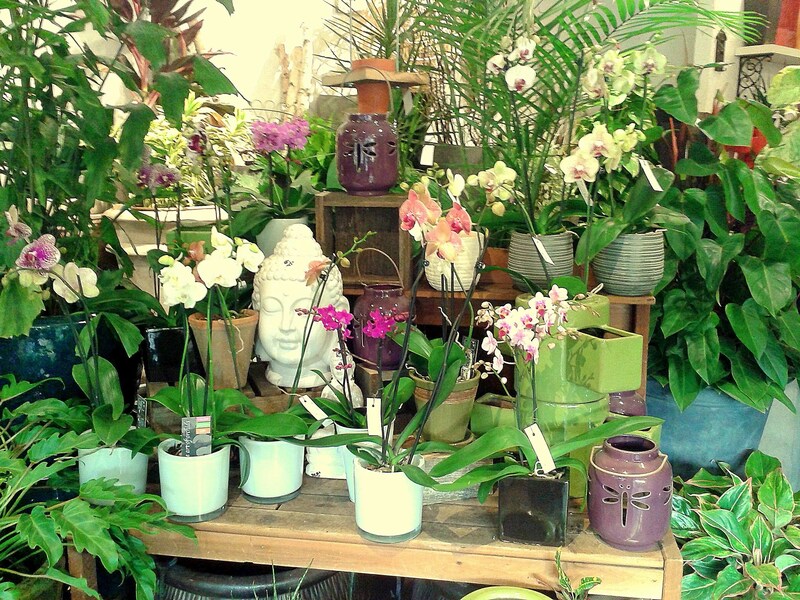 We have orchid varieties native to Ontario! Not only do they grow in many different places, they take many different forms. Some grow in the earth like most plants we know. Some grow in swampy marshes, some in dry, rocky mountains and some in the loving, branching arms of the rainforest. I could fill 100 blog posts on the varying lifestyles of different family members and still not even cover a fraction of what we know about the orchid clan, but most of them you won’t be trying to grow in your living room. So for today we’ll just stick to the most common: the phalaenopsis, or Moth Orchid. Phalaenopsis orchids are a strange breed (species, really). Gorgeous when in bloom, weird and naked looking when not; their roots look like they’re trying to make a break for it and what’s with the bark? A big part of understanding proper orchid care is to understand where it is they come from. For any plant to be happy in a) Ottawa and all its climate-y weirdness, and b) a house with air-drying heating and cooling systems, you have to try to recreate the environment in which it has spent the last billion or so years evolving. In the case of the phal-o that is the balmy, sunny, humid-as-a-monsoon tropics! Please, yes, let’s recreate that in my living room! The phalaenopsis comes from parts of the world where big, spreading trees dominate. Their giant root systems fill the earth and their wide canopies fill the sky. Where in all that is a little orchid to go? Well, you know the saying: if you can’t beat ‘em, climb ‘em! Orchids are epiphytes! Epiphytes are any plant that is able to collect most of their nutrients and moisture from the air. When in their native homes they hang from the crooks of trees, with blooms just spilling down like glorious technicolour waterfalls! Their roots have developed to cling to bark as an anchor. If you’ve ever tried to re-pot an orchid or even just shift the bark chips around you’ve probably noticed some pieces are really hard to separate from the silvery roots. That’s because your orchid thinks he’s high up on a branch and letting go of that bark means tumbling to his doom! So, how do these little monkeys get their food all the way up there? They do get some of their nutrients from the bark itself. When on a live tree, the bark is constantly regenerating and feeding more nutrients to the pretty parasites*. When in a pot here in Canada, the bark is dead and will eventually decompose, losing its nutritional value and also disintegrating into a dense mulch that can collapse on the roots, blocking air flow and effectively suffocating the plant. It is therefore important to periodically change out the potting medium for fresh stuff about every 2-3 years. They also collect nutrients and of course moisture from the humidity in the air, morning dew and copious rainfall. Because they don’t have absorbent soil surrounding them to hold onto extra water, the roots have developed a spongy, silvery skin that can hold a lot of water for drinking later. You’ll notice when you water the roots will turn bright green and then dry to a shiny, silvery white. This is where the clear pots they come in prove handy. To avoid over watering you want to make sure all or most of the roots have returned to the pearly white before wetting again. If you find the top dries out a lot sooner than the bottom you can use a mister to just top-up the surface roots while letting the bottom continue to dry. Another aspect of the rainforest to bear in mind when keeping orchids is the canopy. While generally in a sunnier part of the world, phalaenopsis orchids are always protected from direct sun by their leafy landlords. 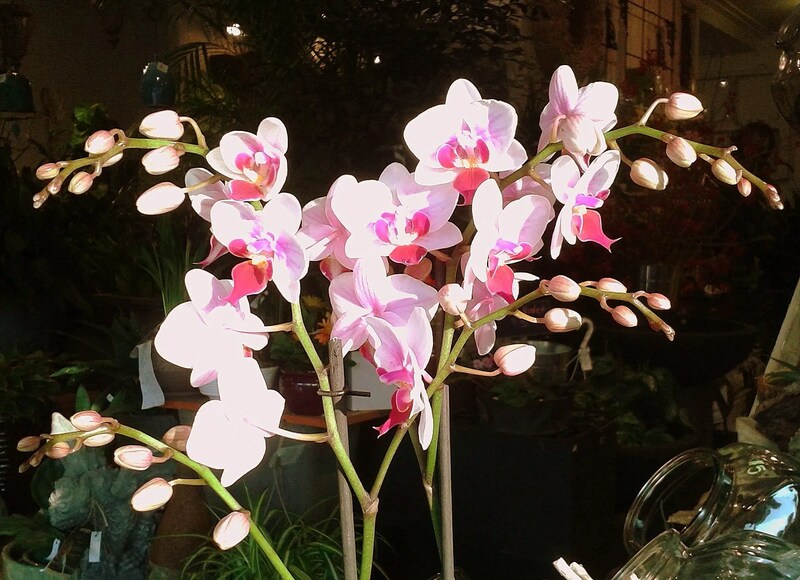 So you want your orchids to have a similar light of nice and bright, but not in a direct beam. This can be played with a bit this far north as early morning sun and later afternoon sun, especially in the winter, is much weaker than it is closer to the equator. Just one of the little beauts we have in store right now! One more thing about the orchid’s origins is that these areas, while generally warmer, do experience significant dips in temperature overnight. Some places can experience a difference of 15 degrees. The orchids have gotten used to this difference and now need it to throw blooms. That’s why around here you’ll see a lot of phal-os blooming in January and February where next to the window the temp can drop considerably at night. You don’t want it to go down any lower than about 13 or 14 degrees celsius, but you want it to be a marked difference from the daytime temperature (of usually about 21-24 degrees). And finally one little note for some who have found success in a rather devious fad: please, for the love of all that is green, do not put an ice-cube on your orchid plant! Do you think they run into a lot of ice in southern Asia? This was a marketing ploy created to sell more plants. Does it kill the plant right off? No. Is it the right amount of water for a weekly drink? Pretty much. But oh, the chills! Taking an ice bath might not kill you but do you really want it to be the only way you bathe? Ice cubes will eventually shorten the life of your plant. It’s far better to use room-temperature water so you don’t shock them. I know this hasn’t covered a lot of the finer details of orchid care in the home, but I hope this look at where they come from can help you understand why they act the way they do. We’ll cover a little more of the nitty gritty details of orchid maintenance in a later post, but for now think of the gorgeous orchids exotic homelands and imagine yourself being transplanted there! * Not actually parasites; I just like alliteration! We love to keep a large selection to choose from!